Xero Accounting Integration is the undisputed master in accounting software, giving you the power to create smart accounting from just about anywhere in the world. SuiteCRM is a revolutionary CRM offering the latest tools to enhance your business around customer-centricity. 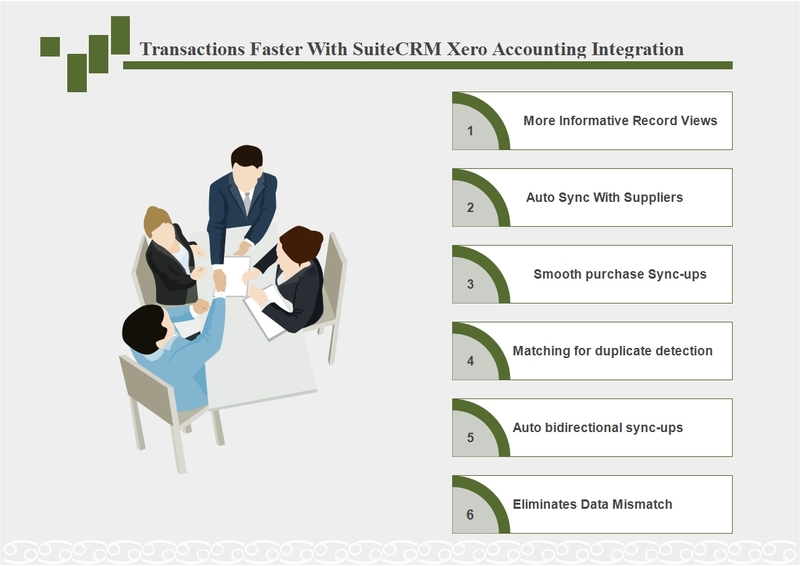 The synergy of Xero and SuiteCRM is a double bonanza, as SuiteCRM Xero Accounting Integration by FyNSiS SuiteCRM Partner brings a seamless flow of data of customers from inside your CRM to the actual billing system in useful handshake so the bills can be generated within CRM. WHY WILL XERO REVOLUTIONALIZE YOUR SUITECRM? Xero Accounting Integration is a premium and popular accounting software to make your billing a simple affair. It empowers your SuiteCRM to make management of invoicing, expenses, reconciliation with customer data for billing and bookkeeping a minimal-effort affair. So, you can concentrate on more productive tasks and take your business to newer heights. "I love the user experience design which is super clean and simple."